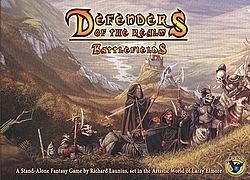 Defenders of the Realm Battlefields is set in the world of Richard Launius' Defenders of the Realm, but is a stand-alone, non-cooperative game in which players compete against one another either one-on-one, two-on-one, or two-on-two. One side represents the Dark Lord's invading army, while the other plays the heroes defending the realm. Each battlefield card bears a special power that the winner of that card receives as a reward, such as "Remove all cards from one battlefield", "Choose the next battlefield to activate", and "Force the loser to give up one won battle". The first team to claim any five battlefields or three battlefields of the same color wins.